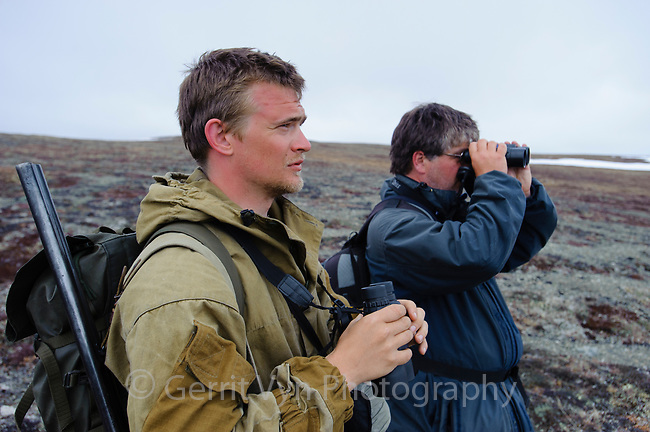 Russian field biologist Egor Loktionov and German volunteer biologist Jochen Dierschke searching the tundra for Spoon-billed Sandpipers arriving on their breeding grounds in spring. Dierschke is one of many biologists and bird watchers that have been drawn to search for the Spoon-billed Sandpiper (and made the difficult “pilgrimage”) over the years. Chukotka, Russia. May.